Ever notice those practical-minded Daybreak planners have a thing for dual-purposes? Take our beautiful Oquirrh Lake, for example. It's not only a great recreation spot with its walking trails, docks, and boats, but the water also irrigates much of the public spaces in Daybreak--or, so I understand. Our homes in Daybreak are not only attractive with their many windows and high-quality siding materials, they alsoÂ reduce our energy bills by letting the sunlight in while keeping the heat and cold out. Playground equipment around here provides not only something fun and often unique for the kids to play on, but also an interestingÂ sculptural elementÂ in the landscape. The east end of Rowdy Park is one of these doubly functioning features of Daybreak. Not only is it a lush green park where communityÂ gatherings like the upcoming Fundraiser Park Party for Huntsman Cancer can be held (Saturday, August 30th from 6pm to 9pm), but it's also part ofÂ Daybreak's rainwater collection network. BetweenÂ the swimming pool and tennis courts on Indigo Sky Way andÂ the community gardens on Vermillion Drive is aÂ giant, lawn-covered drainage ditch. A lot like the one at Central Park, there's plenty of open space here for large picnics, soccer games, and community functions, too. And the sloped sides will be a neighborhood sledding hotspot come winter. Let's just hope during Saturday's fundraiser we don't have another 100-year rainstorm like the one that created Founder's Village swimming pool last year. 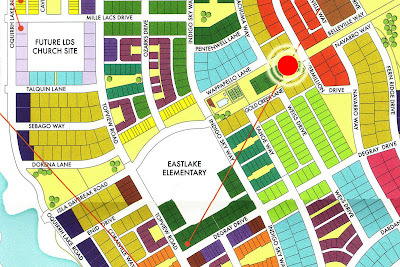 By the way, Rowdy Park is the corridor park that runs from the "spider web" climbing toy on Oquirrh Lake Road and Isla Daybreak Road, past the front of the new Eastlake Elementary School, all the way to the rose garden between Belleville Way and Navarro Way in the east.